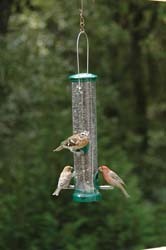 Birds tend to choose feeders that are at the same height where they would find food in the wild. Imitating these natural feeding levels will help you attract the most birds to your backyard. There are two common backyard bird feeding levels: elevated and ground. Elevated-feeding birds live in forests and forage for food in trees. These birds prefer sunflower seeds, safflower, sunflower chips and peanuts. To attract elevated-feeding birds, offer WBU Supreme, Choice or No-Mess Blend in a Quick-Clean® Seed Tube Feeder or hopper-style feeder on an Advanced Pole System® bird feeding station. These birds often live in meadows and/or fields where fallen plant seeds are a food source. Though millet is the preferred seed of most ground-feeding birds, they will eat other grains and seeds, such as sunflower. To attract ground-feeding birds, offer WBU Deluxe Blend, No-Mess Blend or other appropriate blends in a ground feeder like our EcoTough™ Ground Tray. To attract birds at both levels using one feeder, offer WBU Deluxe or No-Mess Blend in an EcoTough™ Classic hopper feeder. This feeder was designed to accommodate both feeding levels. Elevated-feeding birds will eat the larger seeds at the feeder and knock out the millet and other seeds for ground-feeding birds. Our WBU Deluxe Blend is full of sunflower seeds, millet and other seeds. Sunflower lovers will eat at the feeder, and ground-feeding birds will eat the fallen millet.